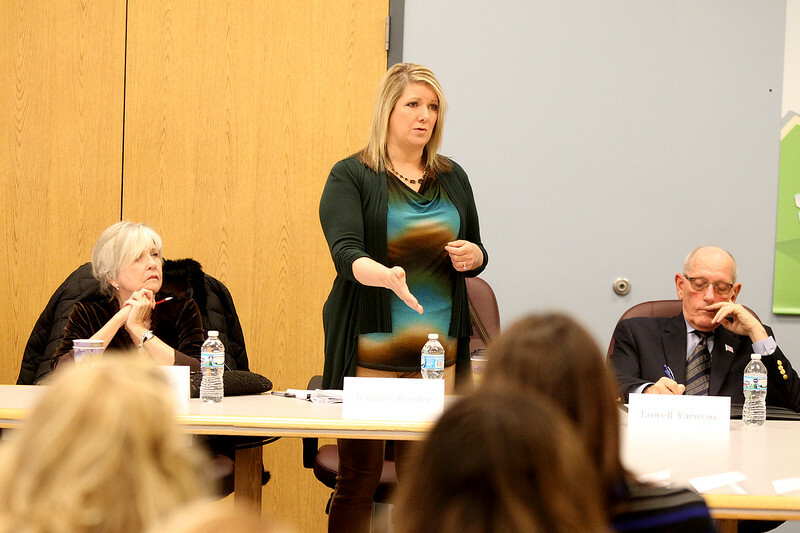 St. Charles School District 303 board candidate Jennifer Reeder (center) introduces herself as candidates Judith McConnell (left) and Lowell Yarusso look on during a candidates' forum at the St. Charles School District 303 Administration Center Wednesday morning. The forum was hosted by the district PTO. Nine candidates are vying for three seats. They are: Kathy T. Hewell, Rick Leidig, Lowell Yarusso, Stephen Bruesewitz, Michael A. Vyzral, Judith McConnell, Jennifer Ann Reeder, Lori Linkimer, Nicholas P. Manheim.